The Greens NSW energy spokesman Jeremy Buckingham today said the NSW Government should reject the National Energy Guarantee (NEG) if it fails to recognise state efforts to reduce emissions as additional to the National Emissions Reduction Target, to ensure that all options are open to the current and future NSW Governments to act on climate change. 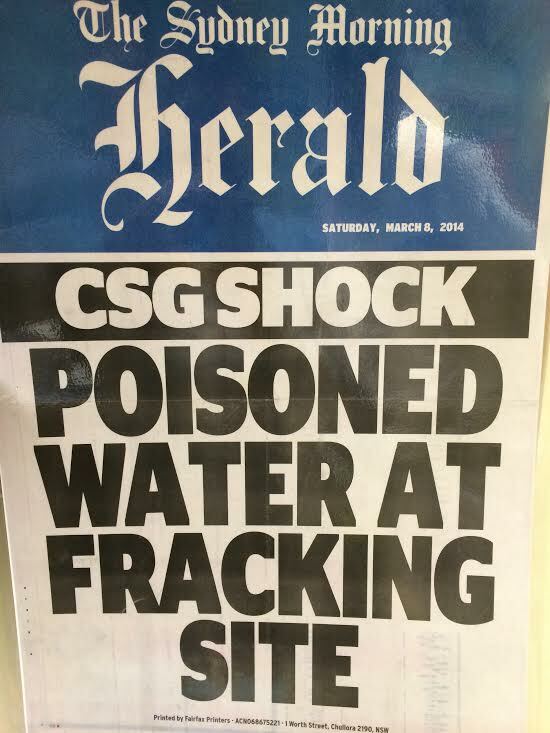 “The National Energy Guarantee has been cobbled together to try to placate the dinosaurs within the federal Coalition party room. The NSW Government should reject any framework that restricts the ability of our state to implement real action to address climate change,” said Greens MP Jeremy Buckingham. “Victoria, the ACT, Queensland and South Australia all have state based renewable energy targets. Any future NSW Government should also implement an ambitious state-based renewable energy target and associated schemes to achieve this target. “If the NEG undermines state-based renewable energy targets or emission reduction targets by not making them additional to the NEG’s emissions reduction target, then it ties the hands of any future state government to reduce emissions and attract jobs and investment in the renewable energy sector to NSW. NSW Greens energy and resources spokesman Jeremy Buckingham today labelled federal resources minister Matt Canavan ignorant on disruptive technology and negligent on climate change as Canavan sets up a panel to push more fossil fuel mining in Australia. “Pushing coal mining in an age of climate change and cheap, mature renewable energy is not only negligent, but is like advocating fax machines in the age of the internet,” said Greens MP Jeremy Buckingham. 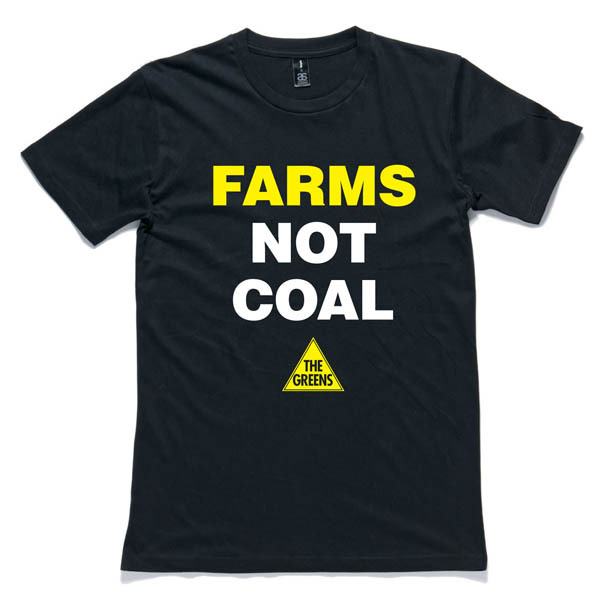 “The science very clearly says that 90% of coal must remain in the ground if we are to have even a 50% chance of keeping global warming under the two degree target that Australia signed up to at the Paris climate summit. 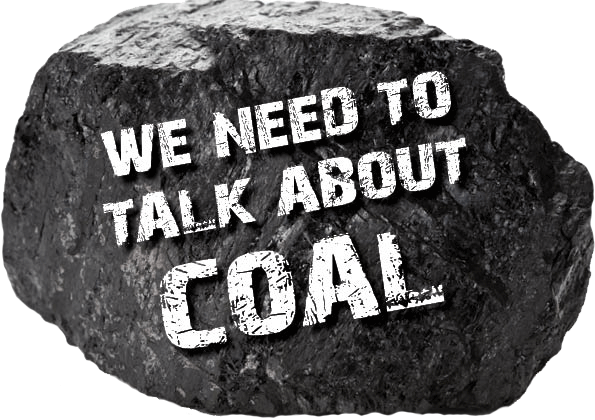 “The Greens want coal mining in NSW phased out within a decade. That is the only path to preventing runaway climate change. That’s not hyperbole, that is unfortunately the physical reality we face. 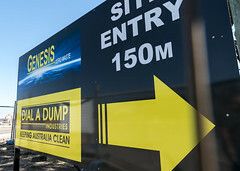 “Rather than ignorantly promoting polluting fossil fuels, Australian governments should be working on transition packages to rapidly transition our energy system to renewable energy and to transition mining dependent communities to other economic sectors. “History is full of disruptive technologies rapidly replacing existing technologies. The motor vehicle and the horse and cart, film and digital cameras, sailing ships and steam ships, mobile phones, computers, and it is clear that renewable energy, which is rapidly decreasing in price and does not pollute the atmosphere is a disruptive technology that is spreading very fast. 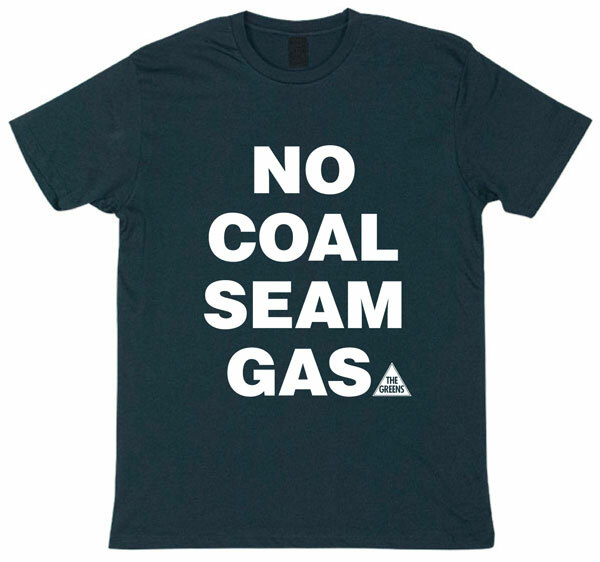 Australian Greens Leader Richard Di Natale and NSW Greens energy and resources spokesperson Jeremy Buckingham will today launch a new policy to phase-out thermal coal mining in ten years with a bill that would set up a framework to limit further coal mining to one billion tonnes. Here is a brief on the framework and also the bill Jeremy Buckingham will introduce into parliament next week. “It is a scientific fact that we cannot continue to burn coal and protect the climate. We must act now before it is too late. “We have run out of time. We are teetering on the edge of disaster and must act seriously now or we will lock in catastrophic levels of global warming with the significant environmental, economic and social disasters that will be caused by a changing climate. “A transition away from coal is inevitable. The real question is whether we transition fast enough to protect the climate, and whether it is a managed transition, or a chaotic collapse. 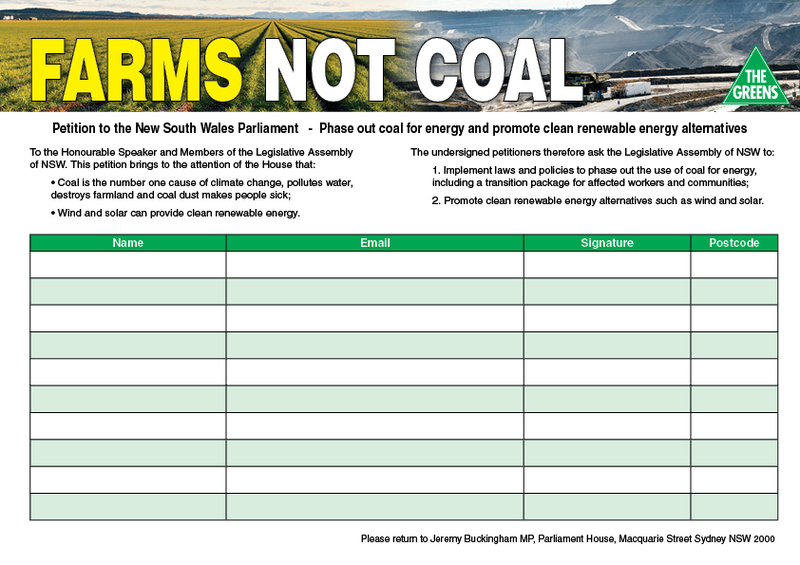 The NSW Greens will introduce a bill into NSW Parliament which will set a ten year phase-out timeline with a total limit on the amount of thermal coal that can be mined in NSW. The Mining Amendment (Climate Protection – Phasing-out Coal Mining) Bill 2017 establishes a framework for a managed phase-out of coal mining in NSW in order to protect the climate from catastrophic global warming. Research published in the esteemed scientific journal Nature found that 90% of global coal reserves must remain in the ground if there is a 50% chance of keeping global warming under 2 degrees Celsius. The Paris Climate Summit agreement set a target of keeping global warming under 2 degrees Celsius, with an ambition of limiting warming to only 1.5 degrees. Under this bill, a maximum of one billion tonnes of thermal coal can be mined over the next ten years (no action would see 2 billion tonnes mined in this period). The framework implements a smooth phase-out trajectory over ten years. The bill empowers the minister to implement a competitive process to allocate coal production under the caps. Mining companies would take part in a competitive auction to purchase the right to mine coal during the phase out period. Around 90% of Australian coal is mined for export. Even if Australia shifted to 100% renewable domestic energy generation, our contribution to climate change through the mining and export of thermal coal would still be huge. The latest climate science and observations conclude that we are in a critical period for action on climate change. If we fail to make the necessary changes to significantly reduce emissions now, then catastrophic climate change will be unavoidable. While these measures may seem drastic, they are a bare minimum of what is required according to the science. A less drastic phase-out of coal could have been possible if the world had started to act after the Rio Earth Summit in 1992, or in the decades since. 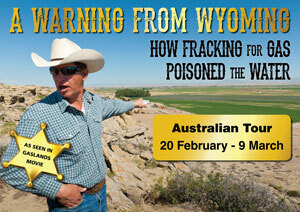 However, successive governments have instead sponsored and approved a massive expansion of coal mining. Without a phase-out plan, almost 2 billion tonnes of thermal coal will be mined in NSW during the next decade, and NSW Treasury forecasts that 9.2 billion tonnes of thermal coal will be mined by 2056. Mining and burning this amount of coal will be a major global contributor to climate change. A competitive auction for mining rights over the ten year phase-out period is expected to raise over $7 billion, a significant proportion should go to assisting workers and regional economies transition to a post-fossil fuel era. NSW Greens energy and resources spokesperson Jeremy Buckingham will introduce the Mining Amendment (Climate Protection – Phasing-out Coal Mining) Bill 2017, into NSW Parliament next Tuesday 7 March.